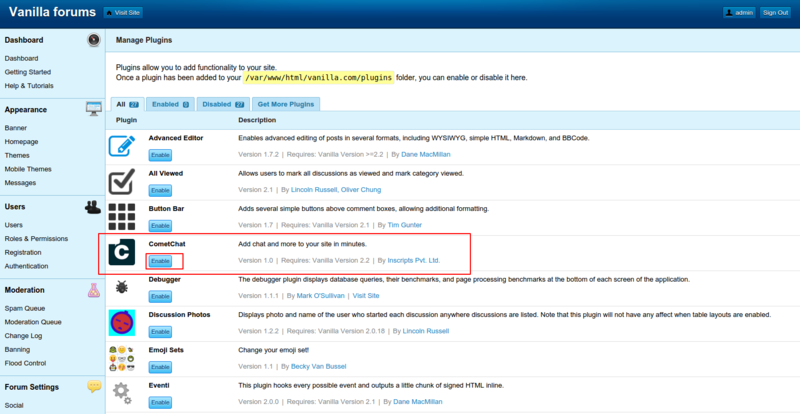 Want to quickly see how the open-source software Vanilla Forums works? You'll find a free and updated demo installation of Vanilla Forums here. Vanilla Forums, also known as as Vanilla OSS is a free, open source forum software developed using PHP as a scripting language and the Garden framework. Its founder, Mark O’Sullivan started working on the project in 2002 to support his own online graphic design and programming community. In the following years Vanilla Forums features went through many changes, building new functionalities like core theming and plugin engines. On July 1, 2006, the first version of the software was finally released. Since then the projects has been constantly supported by the core team and the community of developers, expanding the Vanilla Forums features and making the product better with each release. To get a complete Vanilla Forums review you can click on the links above to login to our Vanilla Forums demo and see what it has to offer. The screenshots below will also give you a preview of how an online demo looks like. The admin demo will walk you through the Vanilla Forums features and help you understand if this forum software is the right fit for your community. 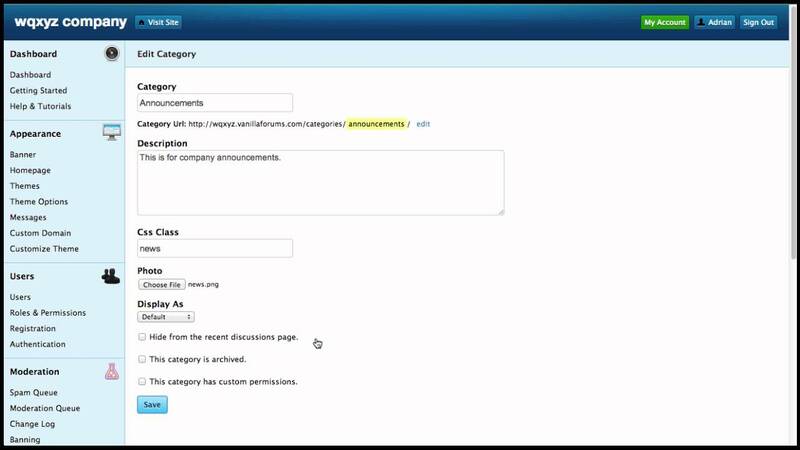 Some examples of features include unlimited categories for your discussions, single-sign on and social media login. If you want to set up your own Vanilla Forums demo you can follow the download link below to get the software for free. Before going through the installation process make sure you read the instructions and comply with all the requirements. 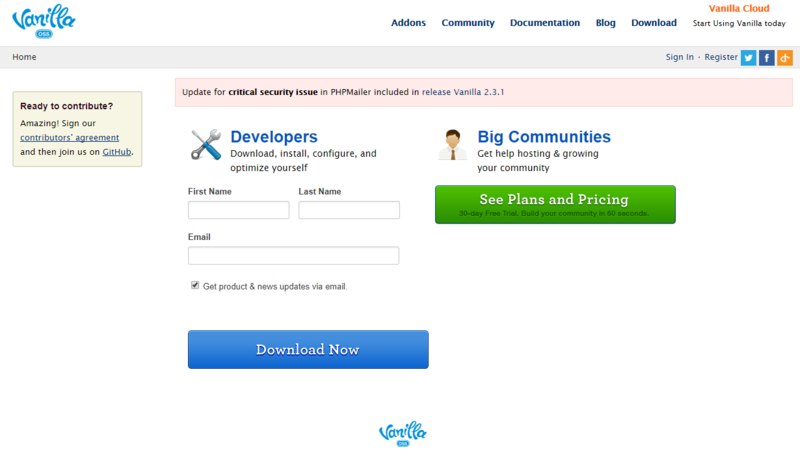 To set up your own, self-hosted Vanilla Forums demo site you will need a server that is running at least PHP 7.0, although 7.1 or higher is strongly recommended. You will also need MySQL 5.0 or higher, with MySQL 5.6 recommended, MySQLi for importing into Vanilla and OpenSSL to use social plugins. 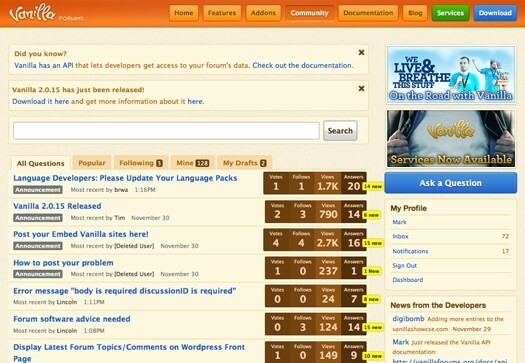 After the installation is successful and your online demo is ready you can change the appearance of your forum using one of the Vanilla Forums themes. There are a lot of Vanilla Forums themes and add-ons available you can choose from, created by the community. Even though the open source version of the forum software has a lightweight core, there are a number of plugins you can install to enhance the current Vanilla Forums features. Some examples include chat, private messages, the ability to see who is online and attachments. Vanilla also allows you to import content from other forums, offers embeddable forums and integrates with other FOSS projects like WordPress. The latest version available for download is 2.3.1 and was released on May 11, 2017 under the GNU license. Vanilla also has a business version that provides an official cloud hosting solution with a 1-click install and offers exclusive features, automatic upgrades, great support and many other benefits. Vanilla Cloud is a complete rewrite of Vanilla using the Garden Framework, an MVC, object oriented, modular, extendable framework. You can try Vanilla Cloud using a free trial at their official website.